Toronto’s Entertainment District is in for a shot of innovation, as Aspen Ridge Homes is developing a new project at Richmond Street and Duncan Street. Studio on Richmond will be two phases (Studio 1 and 2) at 199 Richmond St W. Studio 1 will be a 31 storey tower with 317 suites, and Studio 2 will be a 41 storey tower with 422 suites. This 8000 sq ft space is designed around the new Ontario College of Art and Design by Quadrangle Arhcitects Ltd, and interiors will be by Mike Niven Interior Design Inc. Studio on Richmond will include a 9 storey podium that will house an art gallery and eatery, that will be available to OCAD (which has been granted university status, and is now OCADU). The buildings’ modern architecture features a series of stacked cubes, with terraces on some floors, and green rooftops. Suites will include Torlys engineered wood or smart flooring, granite or Caserstone kitchen countertops, Miele kitchen appliances, Hansgrohe kitchen and bathroom faucets, under-cabinet LED kicthen lighting, under-mounted kitchen sinks, 9′ ceilings, and a balcony or terrace (as per plan). 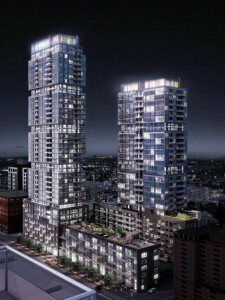 Suites will range in size from 419 sq ft to a 2500 sq ft penthouse, which will occupy the entire top floor. The amenities (located on the 9th floor) will include a 24 hr concierge, exercise facilities (with steam rooms and change rooms), winter lounge, aqua lounge, billiards room, hot tub, Yoga studio, media lounge, party room, dining room, and a bar. Prices are starting in the low $300,000 range. Parking spaces are $43,000 (available for 1 bedroom + den units and larger) and lockers are $4,000. Maintenance fees will be approximately $0.52 / sq ft (hydro and water will be metered separately). The projected occupancy for Studio 1 is November 2013, and Studio 2 is November 2014.